As a country founded on the idea of an “American Dream,” everyone should be afforded the right to financial freedom and success. Whether that means seeking out the best possible contract, forming a business or corporation, selling a business or protecting the rights and interests of your business, you deserve the best. Starting a business or corporation can be both challenging and rewarding. There are hundreds of legal codes, rules, laws, and regulations to follow, but if done properly, they can bring you considerable satisfaction and financial success. Whether you are starting your first business or have years of experience running various companies, it’s always a good idea to let a qualified attorney guide you through the process. With our legal counsel, you can build a strong foundation for your partnership, corporation, or LLC. While nobody ever starts a business with the intention of encountering litigation down the road, it can sometimes be difficult to avoid. When you have Murphy, Taylor, Siemens & Elliott P.C. at your disposal, it can be a little easier to sleep at night. Our attorneys can provide protection of your rights and interests for matters including wrongful termination, breach of contract, business dissolutions, partnership disputes and more. For our skilled attorneys, drafting, reviewing and negotiating contracts and agreements is second nature. To ensure your best interests are protected, let us review all of your contracts before signing. Selling your business can be as complicated as forming it. To make sure all of your assets and interests are protected, it is a legally sound decision to use the counsel and assistance of an attorney. We would be happy to provide these services to you. Every company, regardless of its size or the industry it emcompasses, can benefit substantially by working closely with an experienced St. Joseph Business Law Attorney. Our legal professionals understand that knowing the local, state and federal laws pertaining to businesses or corporations is critical, but it is only one part of the equation. Your attorney should also have an instinctive understanding of what a business needs. What YOUR business needs. 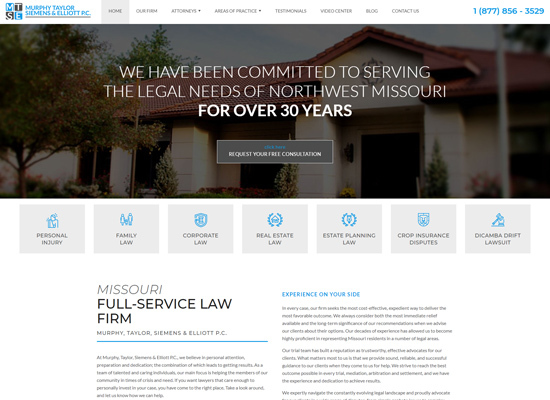 At Murphy, Taylor, Siemens & Elliott, P.C., our St. Joseph, MO-based law firm represents businesses and individuals throughout the state of Missouri. We have both the experience and industry-specific knowledge necessary to give our clients every opportunity to achieve their goals. Don’t hesitate to reach out to us for a free initial consultation. Let us give you the tools to succeed.